We’ve all done it — worn shoes that hurt our feet because they looked great. But that’s not really conducive to dancing all night long. Who wants to dance barefoot and risk getting their toes stepped on? 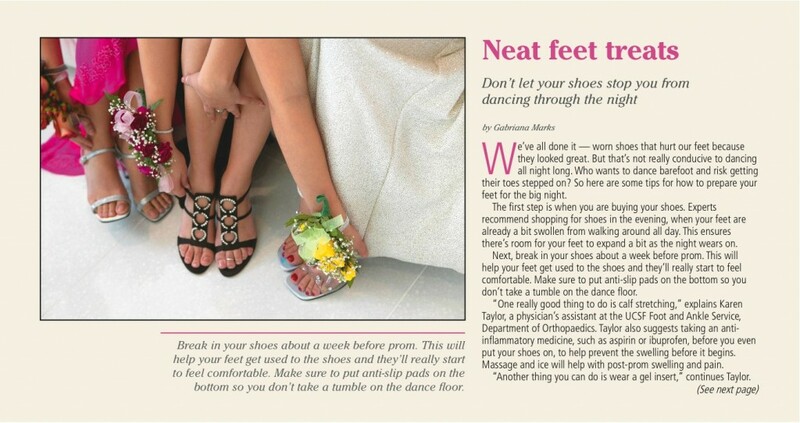 So here are some tips for how to prepare your feet for the big night. The ﬁrst step is when you are buying your shoes. Experts recommend shopping for shoes in the evening, when your feet are already a bit swollen from walking around all day. This ensures there’s room for your feet to expand a bit as the night wears on. Next, break in your shoes about a week before prom. This will help your feet get used to the shoes and they’ll really start to feel comfortable. Make sure to put anti-slip pads on the bottom so you don’t take a tumble on the dance ﬂoor. “One really good thing to do is calf stretching,” explains Karen Taylor, a physician’s assistant at the UCSF Foot and Ankle Service, Department of Orthopaedics. Taylor also suggests taking an anti-inﬂammatory medicine, such as aspirin or ibuprofen, before you even put your shoes on, to help prevent the swelling before it begins. Massage and ice will help with post-prom swelling and pain. “Another thing you can do is wear a gel insert,” continues Taylor. There are plenty of products out there to help keep your feet in place and feeling good. Tip Toes by Foot Petals help stop feet from sliding forward and scrunching your toes in your shoes. With foamy cushions that’ll soothe your heels, keep straps from cutting into feet or prevent heels from slipping up out of your shoes, you can ﬁnd one to ﬁt just about any shoe you choose. A pedicure is also a relaxing way to prep your feet and get pretty toes for the evening. “Choose your salon wisely and go somewhere responsible,” advises Jeanne Haunert, head of the Cosmetology Department at the San Francisco Institute of Esthetics and Cosmetology. Get your pedicure at least a day in advance. That way there are no worries over smudging it when you’re already in a time crunch. And since toes tend not to chip as much as ﬁngers, there’s really no harm in getting your toes done a few days early. Your polish doesn’t need to match your dress, but make sure to pick a color that complements your skin tone. “Toes look great when they match the polish on your ﬁngers or when they’re a shade darker,” adds Haunert. “Sometimes girls come here together and get their nails done before prom – like a little party,” says Angie Duong, owner of Blush Nail Spa in San Francisco. If you’re going to do your own pedicure, make sure to clean all your tools thoroughly before you use them. Duong recommends cleaning your nails, shaping them, cleaning up your cuticles, using a foot scrub to get rid of dead skin under your feet, massaging lotion into your feet and calves and then putting on your polish.